Eldridge Hardie has long been one of my most favorite sporting artists. I first contacted him in 2009 while designing Bill Allen’s “The Unforgettables and Other True Fables” in a long-shot hope that he might allow us to use one of his drawings to be foil-stamped on the book’s cloth cover. Along with being a respected and accomplished artist, Eldridge Hardie is a genuinely warm and generous man. Yes, he said, and sent along the drawing of the pointer head that adorns the book’s cover. 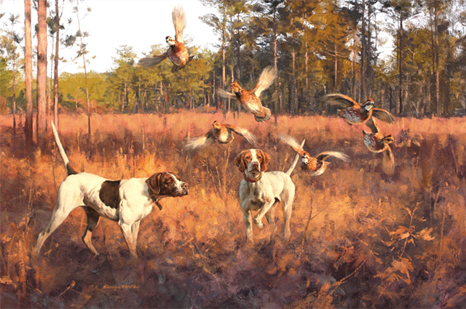 Early this fall, I contacted him again, asking if we could add a few images of his bird dog paintings to Strideaway’s Art Gallery. I also asked him a few questions about how he began drawing and painting bird dogs. Eldridge Hardie was born in 1940 in Boerne, Texas, but soon after moved to his father’s hometown of El Paso where he spent his boyhood dove shooting. With little success, he told me laughing, he and his high school friends also chased around a few Gambel’s quail without the aid of a bird dog. After graduating with a Bachelor of Fine Arts from the School of Fine Art at Washington University in Saint Louis, he made his way to Denver, CO where he has lived with his wife, Ann since 1966. He and his friends duck hunted the South Platte River bottom in southeast Colorado where they also encountered a few quail and pheasant that they hunted with labs. 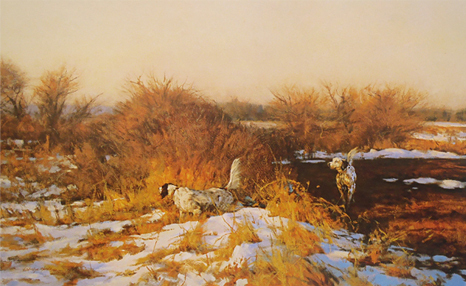 Some years later a chance encounter with a Kansas businessman, interested in a print of flushing quail of Hardie’s he had seen in an advertisement, led to an invitation to go quail hunting. Thus began a 30-year friendship and lead to the first time Eldridge Hardie witnessed a pair of raw-boned pointers lock up on a bevy of bobwhites. Since then, he has hunted wild birds over pointing dogs across North America including Texas, Georgia, Montana, Wisconsin, New Brunswick, and abroad in Scotland. The authority with which he paints his scenes and the human and canine subjects in them comes not only from his talent and devotion to his art but from his passion of the sporting life. The exquisite scenes in his paintings often draped in the last hour of daylight’s golden glow are always of places Eldridge Hardie has hunted. I asked him about the dogs — I swear I have known them all…Buddy, Pete, Belle… Those whose lives revolve around bird dogs, know by heart their posture and intensity on point…their flaring nostrils drinking in the scent of a bevy of quail about to flush or sometimes already exploding in from of them. Only a person deeply in love with such stuff can evoke these emotions so precisely and effectively. Hardie has a collection of photographs he uses as reference…sometimes the head of one dog matched to the body of another but always taken during wild upland hunts. But no believable depictions of dogs like his come from photographs alone. Eldridge Hardie is a master of anatomy. 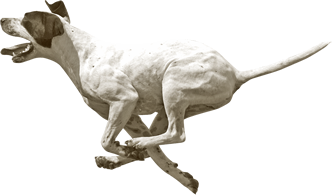 His dogs have the correct skeletal proportions and musculature portraying the athleticism that convince us they are real. A bird dog, he says, is a marvelous, magnificent machine! When I last spoke to El, he was packing for another trip to Kansas to waterfowl and quail hunt with his son, taking along his favorite Labrador retriever. He called me to be sure that I did not fail to mention the Zink and VanCampen families and Bubba Wood who played a significant role in developing his passion for pointing dogs and upland bird hunting. I have not yet had the pleasure to meet Eldridge Hardie or to see his work firsthand but I hope to do both soon. I was, however, fortunate to still find a copy of his wonderful book The Paintings of Eldridge Hardie: Art of a Life in Sport (Stackpole Books, 2002). Copies of the book, now out of print, are scarce and highly sought after. 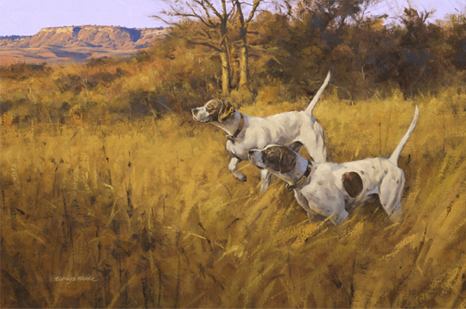 For many more examples of Eldridge Hardie’s wonderful bird dogs and upland hunting scenes, please visit the Strideaway Art Gallery. For much information about Eldridge Hardie and his work, visit his website. There you can follow his adventures by signing up for his E-newsletter. You can also find him on facebook!